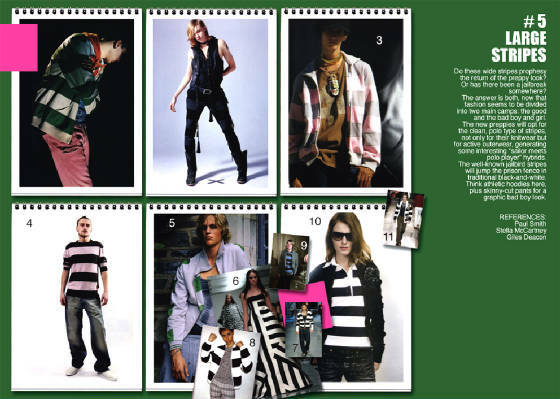 Do these wide stripes prophesy the return of the preppy look? Or has there been a jailbreak somewhere? The answer is both, now that fashion seems to be divided into two main camps: the good and the bad boy and girl. The new preppies will opt for the clean, polo type of stripes, not only for their knitwear but for active outerwear, generating some interesting "sailor meets polo player" hybrids. The well-known jailbird stripes will jump the prison fence in traditional black-and-white. Think athletic hoodies here, plus skinny-cut pants for a graphic bad boy look.